Braided fishing line has become an extremely popular choice for both baitcaster and spinning reels. These so called “Superlines” have many advantages over regular mono and fluoro lines, but when used incorrectly can cause unnecessary frustration. I have a lot of experience with many different brands and styles of braided superlines, and I want to help you get better performance out of your braid. The following 3 superlines are what I consider to be the best braided fishing line for baitcaster and spinning reels. PowerPro Spectra Braid – Editor’s Choice, best overall braided fishing line. Sufix 832 – Smooth, strong, and easy casting braid. Spiderwire Stealth Braid – Best cheap braid. Berkley Fireline – Fused superline, great for spinning reels. Berkley NanoFil – Best light pound test superline. Braided line can be used in almost any fishing situation. When fishing in clear water, it makes for an excellent main line to which to can tie a leader of your favorite fluorocarbon line. In stained waters, there is usually no need to tie a leader, and braid can be you all-purpose line. Finally, braid excels at fishing heavy cover thanks to its toughness and no-stretch. Here are some other benefits to braid that you might not know. Small Line Diameter – On packages of braided line you will typically see two numbers, like “20/6”. This means 20 lb test line, with the equivalent diameter of 6 lb test. All that means is braid is much stronger than mono and fluoro lines of equal diameter. Longer Casting Distance – Braid casts a mile for a couple of reasons. First, these superlines are made of advanced engineered fibers, with fancy marketing names like “Spectra”, “Dyneema”, and “Gore” fibers. That means is they have special properties that makes them smooth and easy to handle. Combine those properties with the smaller diameter, and you have a line that you can effortlessly launch your baits with. No Stretch/Sensitive – Unlike monofilament, a braided fishing line has virtually zero stretch. This makes for an extremely sensitive line. 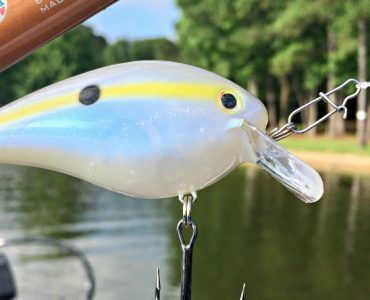 It’s easier to feel what your lure is doing, and you will detect more bites. The lack of stretch means you can set the hook much faster and easier than with monofilament. Getting bass out of thick cover is easier with braid. Tough & Durable – Braid excels at fishing tough cover like wood, brush, rocks, mats, and boat docks. Braid is tough so you won’t be retying nearly as often. You could go a whole season on one spool of braid if you wanted to. If you are a cost conscious angler, you can use a mono backer and make your spool of braid go further. I’ve tried a lot of different braided fishing lines over the years, and yes, some are superior to others. A spool of 300 yards will cost quite a bit more than comparable mono, but generally speaking, you get what you pay for. Just remember that the braid will last far longer than any other line you might try. After a lot of experimentation, these are my favorite braided fishing lines for use on spinning and baitcasting reels. PowerPro is some of the best braid for bass fishing that I have used. It is manufactured in the USA for the Shimano fishing company. It is made of Spectra® fibers, which are a high tech polyethylene fiber made by Honeywell. PowerPro then uses a process called Enhanced Body Technology, which is a fancy way of saying it makes the line round and smooth. I’ve used PowerPro on everything from 60lb for punching mats to the 10lb for drop shot fishing. Not once have I had a knot fail (double palomar) or had a line breakage. I once had the same spool of PowerPro on my flippin’ stick for over 2 years, so it has proven to us that it’s a durable line. It comes in excellent colors like Moss Green, Hi-Vis Yellow, and Vermillion Red. Moss Green is perfect for most fishing conditions. Hi-Vis Yellow works great as a drop shot main line, with a mono/fluoro leader. That allows you the visibility of subtle bites with the benefit of a clear line for gin clear waters. Sufix 832 is an advanced superline manufactured by Rapala. The “832” simply means 8 fibers with 32 weaves per inch. 7 of the fibers are Dyneema for strength and water repellence, while the 1 GORE fiber provides better resistance to fraying and improves the blends overall castability. Sufix 832 is generally more expensive than PowerPro, but the quality of the line is excellent. 832 is extremely smooth and casts with an effortlessness that can’t be denied. I’ve used 832 on swim jig and chatterbait setups, and it performs well. I know the abrasion resistance is good because after a day of pulling a swim jig through the sticks and thickets there is little sign of wear, just some slight color fading. 832 comes in five different colors, but the only ones I recommend are the Lo-Vis Green and Hi-Vis Yellow (for the same reasons I like those colors on PowerPro). The Camo color is an interesting idea, but when I tested this line, it seemed to be more visible in the water than regular green was. Ghost is highly visible, not transparent as the name indicates. So stick with Lo-Vis Green for most situations, and if you need a high visibility for finesse fishing, go with the Yellow, Ghost, or Neon Lime colors. 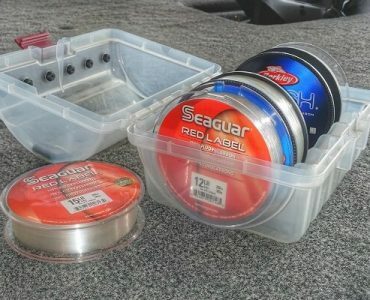 When I first started bass fishing as a teenager, all there was to choose from at my local tackle store was Fireline and Spiderwire. I tried Fireline but didn’t care for the dental floss feel and the line memory that came with it. So I started fishing with Spiderwire Stealth for a long time after that. Spiderwire Stealth is manufactured by the mega brand Pure Fishing. Like Sufix, Spiderwire is constructed from Dyneema polyethylene fibers, and are treated with a fluoropolymer coating that is designed to enhance the handling and castability. Spiderwire is smooth and easy to cast, but it tends to lose its color faster than my other favorite lines. After a day of fishing, you’ll also notice the last 3 to 4 feet of line will start to look a little fuzzy. That has never caused a line failure for me, but it is just something I’ve noticed. In my experience, it’s maybe not quite as good as Sufix 832 or PowerPro, but overall Spiderwire Stealth is a solid superline to fish with. Berkley Fireline was one of the first superlines to come out, and it’s been popular ever since. 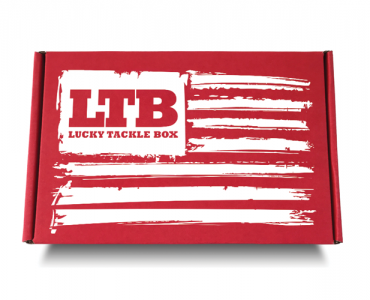 The first thing you’ll notice after taking it out of the box is how it doesn’t feel like a normal braided line. Fireline is actually a thermally fused line, which gives it that different texture. Fireline might even be the best braid for spinning reels. It’s actually been optimized over the years to be just for spinning reels. It has a little bit of wiry memory to it that makes it stick to spinning reel spools better than slick braids. That means it won’t jump off the spool by itself on the cast and blow up into a birds nest. The standard color of choice is Smoke, but Fireline Crystal has become popular more recently. Crystal is not as clear as fluorocarbon, but it is far more translucent underwater than regular Fireline. 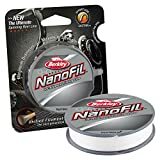 NanoFil is another excellent superline for spinning reels. It’s not a braid, it’s a Uni-Filament line formed by molecularly bonding hundreds of tiny Dyneema nano-filaments. The result is a line with super thin diameter, that is smooth and round like mono, but strong like a braid. The one thing you need to understand before trying NanoFil is that you need to be careful about your knot choices. The smooth and slick line is great for casting on spinning gear, but using the wrong knots can lead to frustration. Berkley recommends the “Nanoknot” which is basically a doubled over Palomar knot. Braid is great for so many uses, but it can be frustrating to use if you don’t pair it with the right equipment. So the next time you try braided line, remember these tips, and you’ll have a much better experience. Spooling Tips – Braid fibers are slippery, and can slip on your spool if you don’t have something for it to grip onto. Some spinning reels have a “braid ready” spool, and all you need to do is secure the tag end onto the clip on the side of the spool. 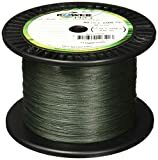 For all other reels, if you plan on tying the braid directly to your reel spool, it’s a good idea to place a small piece of electrical tape onto the spool for the line to grab onto. You’ll want to apply a good amount of tension on the line as you spool to prevent the line from digging into itself later. Line Size vs Lure Weight – Braid is a little more forgiving that other lines, but it is still important to choose a size of line that pairs well with the weight of the tackle you’ll be using. A ¼ ounce shaky head is not going to cast well on 50lb braid, and you won’t have good results trying to punch mats with 20lb braid. On spinning reels, I recommend 10-20 lb braid (4-6 lb diameter), and not any higher than 30lb (8lb diameter) braid because you start to lose castability and risk birds’ nests and wind knots. Tie Proper Knots – Braid is slippery compared to mono and fluorocarbon lines, so it’s critical you ties good knots. Too many people don’t know how to tie a good Double Palomar knot and blame the braid for knot failure or what they think is ‘line breakage’. Another good knot for braid is the improved clinch knot. These knots won’t slip, as long as you tie them right. 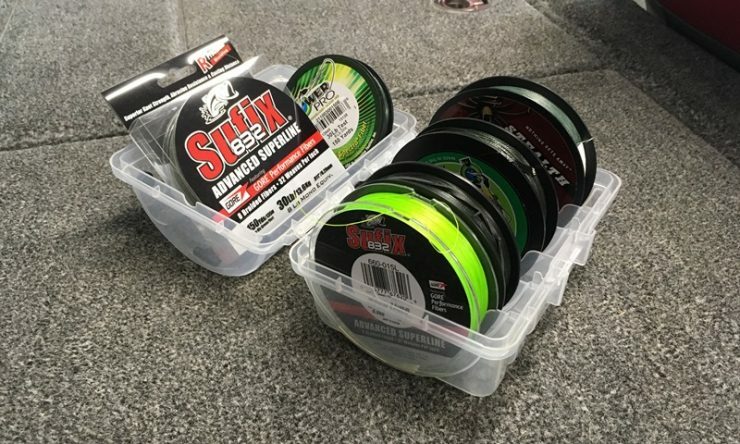 Line Conditioner – Line conditioner really works wonders with mono and fluoro, but it also can improve performance on your braided fishing line. Just give each spool a few sprays for coverage the night before you fish and you will have softer, suppler line to work with. Re-Color Faded Line – The dye used on superlines will tend to fade over time and with use. All braids do this to some extent. I like the Moss Green and Timber Brown Power Pro colors the best, but after a while the color will lighten up a bit. The easy solution is to carry a few permanent markers in the boat and run the tip along the last 5 feet of line to refresh the color. If it works for KVD, then it ought to work for you to! Have you ever tried stream fishing for brown trout using a spinning reel with a braided line? I’m considering trying it while casting a #13 floating Rapala upstream. Do you think using a moss green color with a mono/fluoro leader would work without alerting the fish? Any input would be appreciated. If not I’ll let you know how I did sometime in the middle of May. Thanks for your informative reviews. I’ve never stream fished for Brown Trout, but I think a light mono leader with small diameter braid main line could work. Fluoro will sink, which is why I suggest mono. 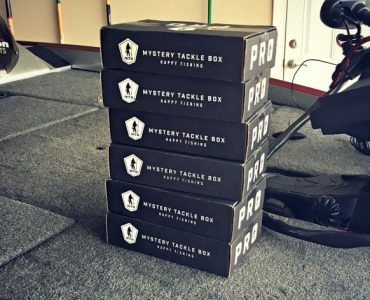 Hi, I have 3 rod and reel baitcasters that I use the most. I wanted your opinion on which one I should use top water bait, superfluke, and Texas rigged worms on. Also what lb. braided line I should use for each. 1) Shimano Curado 200GH 7.2:1 gear ratio on 7’ Duckett Ghost MH rod. 1. Texas Rig: 20-30lb braid depending on the severity of the cover. With that said, I’d encourage you to try fluorocarbon for the Texas Rig, and regular old Mono still works great for topwater baits. How is line twist memory etc…with the nano? It’s pretty forgiving actually. I think alot of pros have been using it for their drop shot main line for that very reason. Just be sure to tie a good knot…it’s a very slippery line.